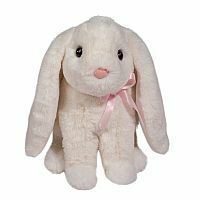 Frannie sitting bunny is a darling addition to Spring! Ultra soft, creamy white material. Big floppy ears hang low and offer oodles of sweetness. Soft pink satin ribbon adds a touch of color. Sitting at 8″ tall, recommended for ages 24 mos and up.